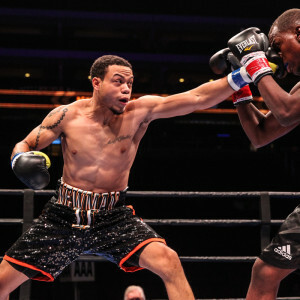 “Training camp was great,” says Kevin Newman , who will be showcasing his skills this Friday evening on the undercard of the Tony Harrison-Ishe Smith card in Vegas (which will be aired on Bounce TV). The 7-1-1 Floyd Mayweather protégé will be coming back after his first loss, which occurred on the undercard of last year’s Floyd Mayweather-Conor McGregor superfight. In an era where a “perfect record” is vastly over-rated (aside from Mayweather and Rocky Marciano, how many all time greats retired undefeated? ), Newman looks at things with an insight many seem to be lacking in today’s fight game. After all, boxers from Ali to Dempsey, from Leonard to Duran to Jack Johnson, all had L’s on their resumes – some before they were titlists. “It was tough at first,” the 26 year old admits. Before the fight, the Vegas native had been placed on antibiotics. “They actually made me sick,” he says. Not that Newman is in the excuse making business. “I tried to have a Michael Jordan flu game moment and just came up short,” he explains. Honesty can be a refreshing thing in the fight game. So can dedication. Unlike many former and current fighters of talent who have wasted their careers on the wild life, Newman comes across as a particularly dedicated individual. “It’s not hard to fight temptation at all,” he says, making it clear that drinking, clubbing, and the night life simply aren’t this thing. “That stuff doesn’t entice me at all,” he adds. What does entice Newman, however, is the thought of providing for his family. A father of two, he speaks openly and with pleasure about his children. “He’s special,” Newman says of his son. “He loves boxing – he’s a different breed.” And his daughter? “She’ll be two,” he claims. “She’s my sweetheart.” Not that Newman necessarily wants his kids in the family business. “I’m not going to push my kids on anything,” he states. Boxing, however, has most certainly been a part of the Newman family throughout the years. His grandfather was in the fight game. What’s more, his mother gave him a pair of boxing gloves when he was three. After a certain point, Newman says: “My dad just kind of put it (boxing) out there.” It was love at first sight. “I’ve been addicted,” he says of the sport he’s enthralled with. “I’ve watched Rocky a hundred million times.” Such genuine engrossment in all things boxing catches the eyes of people like the Mayweather family, who have the clout to send a career into the stratosphere. “I’ve been here since I was nine,” Newman says of the Mayweather boxing gym. “It’s a cool place.” A longtime friend of Jeff Mayweather, Newman is now a part of the esteemed Mayweather Promotions roster. “It’s a great company,” says Newman. “They’ve been very, very good to me.” Newman has kind words for the most famous member of the Mayweather clan, as well. “Floyd Mayweather has always been extra generous to me,” he adds. As for the future, Newman takes a mature, productive view of things. “In this game…you have small goals and big goals,” he says. A win Friday is a must, of course, but after that, there’s more mountains for the man to climb. “I was going to campaign at middleweight,” says Newman. “I always fought at catch weight.” Now, however, it looks like the super middleweight division will be in the man’s future. Perhaps most tellingly, Newman admits openly that he’s a work in progress, that he has room to grow. For instance, when asked who throughout history he’d most like to fight, Newman answers in direct relation to where he currently resides on his journey. When he answers, for instance, that his dream opponents would be “guys like a James Toney and a Roy Jones,” Newman makes it clear that it would have to be “at this (same) point in their careers.” Such self awareness is unique for a young, hungry fighter. Unique but impressive. “I’m not even in my prime yet,” he says. When speaking of the boxing process, Newman is a sharp study. Names like Ali and Mayweather dot the landscape of his mind. “I just tend to take things from those guys,” he says, speaking of their distinctive styles, making it clear that each fighter has to employ what works for him or her individually. “Some things work and some things don’t,” for each particular individual, he claims. Studying high end fighters has taught the man a particularly invaluable lesson, “that discipline is key.” Yet when it comes to the modern boxing game, a winning personality helps, as well. I ask Newman if he feels his easily engaging personality can help him along in his career. He argues that “when you’re easy to work with,” things do indeed go smoothly. That rule applies both inside and outside the ring. “You’ve got to be accessible to people,” he says, bringing up Ali. “He was always accessible to people…I never turn down an autograph or picture.” The fighter may end up signing more than a few photographs if things turn out as planned this week in his hometown. “I don’t mind traveling, but I love fighting at home,” Newman says of Vegas.